Almighty God, whose servant Dominic grew in knowledge of thy truth and formed an order of preachers to proclaim the good news of Christ: Give to all thy people a hunger for your Word and an urgent longing to share the Gospel, that the whole world may come to know thee as thou art revealed in thy Son Jesus Christ; who liveth and reigneth with thee and the Holy Spirit, one God, for ever and ever. Amen. 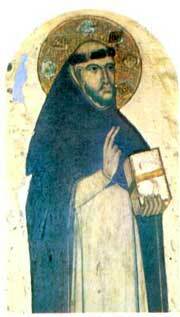 Dominic was born in Castile, in Spain, in 1170. He entered the priesthood, and eventually became prior of the canons of the cathedral chapter (the clergy who formed the staff of the cathedral and conducted the daily worship services) at Osma (42:52 N 3:03 W). The turning point of his life came in 1206, when he was chosen to accompany the bishop on a visit to southern France, to an area held by the Albigenses. These were a heretical sect more or less directly descended from the early Gnostics and Manichees. They were dualists, holding that there are two gods, one the god of goodness, light, truth, and spirit, and the other the god of evil, darkness, error, and matter. The material universe is the creation of the bad god. The good god made the souls of men, and the bad god kidnapped them and imprisoned them in bodies of flesh. On their first night in Albigensian country, they stayed at an inn where the innkeeper was an Albigensian. Dominic engaged him in conversation, they sat up all night talking, and by dawn the man was ready to become an orthodox Christian. From then on, Dominic knew what his calling in life was. Dominic and his bishop undertook to study the Albigensian beliefs and to engage in public debates with their opponents. They seemed to be making some progress, but in 1207 the bishop died, and in the same year the murder by Albigenses of the papal legate moved the pope to declare a crusade against the Albigenses, which lasted about five years. Dominic continued to preach and to debate where he could, and in 1215 he founded an order of preachers, who were to live in poverty, and devote themselves to studying philosophy and theology and to combatting false doctrine by logical argument rather than by the use of force. He was convinced that a major obstacle to the conversion of heretics was the material wealth of some of the clergy, which made plausible the accusation that they were concerned for their purses and not for the glory of God, and made workers indisposed to hear them. He therefore determined that the brothers of his order should live lives of poverty and simplicity, being no better off materially than those they sought to convert. When he was in Rome, seeking authorization for his order from the Pope, the Pope gave him a tour of the treasures of the Vatican, and remarked complacently (referring to Acts 3:6), "Peter can no longer say, 'Silver and gold have I none.'" Dominic turned and looked straight at the Pope, and said, "No, and neither can he say, 'Rise and walk.'" He got the permission he was seeking, and the order grew and flourished. Officially known as the Order of Preachers (hence the letters O.P. after the name of a member), it was informally known as the Dominicans, or the Blackfriars (from the color of their cloaks). Two of their best-known members are Albertus Magnus (Albert the Great, 1200-1280, see 15 Nov), who was famous for his learning in numerous fields, and his pupil Thomas Aquinas (1225-1274, see 28 Jan), who wrote reconciling Christian theology with the philosophy of Aristotle, which was then being rediscovered in western Europe, and was thought by many to be a threat to Christianity. In later years, the Order forgot its commitment to "logic and persuasion, not force" as the means of bringing men to Christian truth, and many of its members were active in the Inquisition. 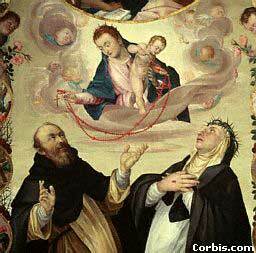 Dominic was three times offered a bishopric, and refused, believing that he was called to another work. He died in 1220 in Bologna, Italy, after a preaching mission to Hungary. His emblem in art is a dog with a torch in its mouth, a pun on his name (the Dominicans are sometimes called the "Domini canes", the hounds of the Lord), and a reference to his relying on the power of preaching.